The purpose of this work is to provide a method for the design of an axial flow compressor stage. This latter represents the front stage of a multistage compressor of industrial gas turbine. The proposed 2D design approach is based on the mean line concept which assumes that mean radius flow conditions prevailing at all other radial stations. The different conservation equations of fluid mechanic; mass, momentum, and energy with ideal gas state equation are applied in conjunction with the NASA empirical relations to compute both incidence and deviation angles at design condition. A FORTRAN computer program was implemented with the inputs such as mass flow rate, tip speed, pressure ratio, ambient temperature and pressure under larger flow coefficient and high reaction ratio. Design process begins with calculation of the channel geometric form from inlet to outlet stage. Thermodynamic properties of the working fluid are determined at rotor inlet, stator outlet and the intermediate station. Detailed geometry of the cascade; chord, pitch, camber and stagger angle is identified for both rotor and stator. The generation of the blade coordinates is performed on the basis of NACA65 profile with circular mean camber line. The necessity of industrial gas turbine power plants increases with the rise demand of electricity. It represents one of the most important plants in the energetic engineering field. Generally, gas turbine incorporates three main parts: compressor, combustion chamber and turbine. These parts forms the Brayton thermodynamic cycle used in either electricity production in residential and industrial areas or thrust generation in the aviation field. Compressor has the primordial role because high efficiency of the gas turbine is strongly connected to the pressure ratio delivered by the compressor. A lot of works were carried out in the field of design and analysis of axial compressors. However, to understand all details and ideas, from these works, leading to design the axial compressor and give the detailed geometric form of blading, hub, casing and its different parts, a tedious work will be devoted. The purpose to model compressor stage, on the basis of empirical correlations and thermodynamic relations, is to provide the detailed geometry in order to use it in the analysis process and avoiding the CFD approach which consumes a long time during the calculation in the design operation. In fact, this paper represents a tentative in this field for designing an axial compressor stage using the one-dimension mean line approach based on constant outer diameter design. The compressor stage that will be calculated is qualified constant outer diameter (COD). The stage is designed without inlet guide vane and delivers a pressure ratio π=1.2 MathType@MTEF@5@5@+= feaagKart1ev2aqatCvAUfeBSjuyZL2yd9gzLbvyNv2CaerbuLwBLn hiov2DGi1BTfMBaeXatLxBI9gBaerbd9wDYLwzYbItLDharqqtubsr 4rNCHbGeaGqiVu0Je9sqqrpepC0xbbL8F4rqqrFfpeea0xe9Lq=Jc9 vqaqpepm0xbba9pwe9Q8fs0=yqaqpepae9pg0FirpepeKkFr0xfr=x fr=xb9adbaqaaeGaciGaaiaabeqaamaabaabaaGcbaqcLbsacqaHap aCcqGH9aqpcaaIXaGaaiOlaiaaikdaaaa@3B72@ with a mass flow rate m=170kg/s. Among the main non-dimensional design parameters which are used to give the overall shape of velocity triangles; flow coefficient ϕ= Ca/U =0.7 MathType@MTEF@5@5@+= feaagKart1ev2aqatCvAUfeBSjuyZL2yd9gzLbvyNv2CaerbuLwBLn hiov2DGi1BTfMBaeXatLxBI9gBaerbd9wDYLwzYbItLDharqqtubsr 4rNCHbGeaGqiVu0Je9sqqrpepC0xbbL8F4rqqrFfpeea0xe9Lq=Jc9 vqaqpepm0xbba9pwe9Q8fs0=yqaqpepae9pg0FirpepeKkFr0xfr=x fr=xb9adbaqaaeGaciGaaiaabeqaamaabaabaaGcbaqcLbsacqaHvp GzcqGH9aqpjuaGdaWcgaGcbaqcLbsacaWGdbGaamyyaaGcbaqcLbsa caWGvbaaaiabg2da9iaaicdacaGGUaGaaG4naaaa@40E5@ , and reaction ratio Λ= ( h 2 − h 1 )/ ( h 03 − h 01 ) =0.6 MathType@MTEF@5@5@+= feaagKart1ev2aqatCvAUfeBSjuyZL2yd9gzLbvyNv2CaerbuLwBLn hiov2DGi1BTfMBaeXatLxBI9gBaerbd9wDYLwzYbItLDharqqtubsr 4rNCHbGeaGqiVu0Je9sqqrpepC0xbbL8F4rqqrFfpeea0xe9Lq=Jc9 vqaqpepm0xbba9pwe9Q8fs0=yqaqpepae9pg0FirpepeKkFr0xfr=x fr=xb9adbaqaaeGaciGaaiaabeqaamaabaabaaGcbaqcLbsacqqHBo atcqGH9aqpjuaGdaWcgaGcbaqcfa4aaeWaaOqaaKqzGeGaamiAaKqb aoaaBaaajeaibaqcLbmacaaIYaaaleqaaKqzGeGaeyOeI0IaamiAaK qbaoaaBaaajeaibaqcLbmacaaIXaaaleqaaaGccaGLOaGaayzkaaaa baqcfa4aaeWaaOqaaKqzGeGaamiAaKqbaoaaBaaajeaibaqcLbmaca aIWaGaaG4maaWcbeaajugibiabgkHiTiaadIgajuaGdaWgaaqcbasa aKqzadGaaGimaiaaigdaaSqabaaakiaawIcacaGLPaaaaaqcLbsacq GH9aqpcaaIWaGaaiOlaiaaiAdaaaa@563B@ . The diffusion factor for both rotor and stator equal to 0.5. The following Table 1 shows the detailed specification used to carry out the preliminary design calculations for the axial flow compressor stage. In fact, the first stage blades, being the longest, are the most highly stressed. Therefore, the security threshold considered by the designer for which the stress problems are not usually critical in the sizing of the annulus is the tip speed of around 350m/s. The same considerations of the stress problems lead to choose relatively low hub-tip ratio in order to decrease the blade stresses; rth=0.5. Concerning the stagnation conditions at inlet, the ambient air temperature T0=288K and ambient pressure P0=1.01325bar. The absolute inlet air angle is set to 15 degrees. Figure 1 T-S diagram of the compression process in the stage. 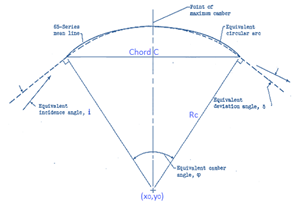 C, at, Mt, A, rt, rh, rm, Um represent the axial velocity, tip speed of sound, tip Mach number, cross section area, tip radius, hub radius, mean radius and blade speed at mean radius, respectively. Using the following algorithm, we can find the geometry at exit stage. where N MathType@MTEF@5@5@+= feaagKart1ev2aaatCvAUfeBSjuyZL2yd9gzLbvyNv2CaerbuLwBLn hiov2DGi1BTfMBaeXatLxBI9gBaerbd9wDYLwzYbItLDharqqtubsr 4rNCHbGeaGqiVu0Je9sqqrpepC0xbbL8F4rqqrFfpeea0xe9Lq=Jc9 vqaqpepm0xbba9pwe9Q8fs0=yqaqpepae9pg0FirpepeKkFr0xfr=x fr=xb9adbaqaaeGaciGaaiaabeqaamaabaabaaGcbaqcLbsacaWGob aaaa@3758@ , η stg MathType@MTEF@5@5@+= feaagKart1ev2aaatCvAUfeBSjuyZL2yd9gzLbvyNv2CaerbuLwBLn hiov2DGi1BTfMBaeXatLxBI9gBaerbd9wDYLwzYbItLDharqqtubsr 4rNCHbGeaGqiVu0Je9sqqrpepC0xbbL8F4rqqrFfpeea0xe9Lq=Jc9 vqaqpepm0xbba9pwe9Q8fs0=yqaqpepae9pg0FirpepeKkFr0xfr=x fr=xb9adbaqaaeGaciGaaiaabeqaamaabaabaaGcbaqcLbsaqaaaaa aaaaWdbiabeE7aOLqbaoaaBaaajeaibaqcLbmacaWGZbGaamiDaiaa dEgaaSqabaaaaa@3D40@ and err MathType@MTEF@5@5@+= feaagKart1ev2aaatCvAUfeBSjuyZL2yd9gzLbvyNv2CaerbuLwBLn hiov2DGi1BTfMBaeXatLxBI9gBaerbd9wDYLwzYbItLDharqqtubsr 4rNCHbGeaGqiVu0Je9sqqrpepC0xbbL8F4rqqrFfpeea0xe9Lq=Jc9 vqaqpepm0xbba9pwe9Q8fs0=yqaqpepae9pg0FirpepeKkFr0xfr=x fr=xb9adbaqaaeGaciGaaiaabeqaamaabaabaaGcbaqcLbsaqaaaaa aaaaWdbiaadwgacaWGYbGaamOCaaaa@397D@ represent the revolutions per minute, the stage efficiency and the convergence error, respectively. 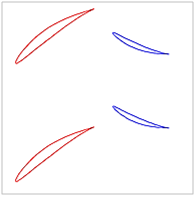 To calculate the blade angles, an iterative procedure is required with assuming an initial value for the blade camber angle. Using this value of the blade camber angle, the design incidence angle and the design deviation angle are computed. From these calculated values of incidence and deviation, a new value of camber angle is obtained and compared with the assumed value. This process is repeated until convergence. where : K sh MathType@MTEF@5@5@+= feaagKart1ev2aqatCvAUfeBSjuyZL2yd9gzLbvyNv2CaerbuLwBLn hiov2DGi1BTfMBaeXatLxBI9gBaerbd9wDYLwzYbItLDharqqtubsr 4rNCHbGeaGqiVu0Je9sqqrpepC0xbbL8F4rqqrFfpeea0xe9Lq=Jc9 vqaqpepm0xbba9pwe9Q8fs0=yqaqpepae9pg0FirpepeKkFr0xfr=x fr=xb9adbaqaaeGaciGaaiaabeqaamaabaabaaGcbaqcLbsacaWGlb qcfa4aaSbaaKqaGeaajugWaiaadohacaWGObaaleqaaaaa@3B4D@ and K δt MathType@MTEF@5@5@+= feaagKart1ev2aqatCvAUfeBSjuyZL2yd9gzLbvyNv2CaerbuLwBLn hiov2DGi1BTfMBaeXatLxBI9gBaerbd9wDYLwzYbItLDharqqtubsr 4rNCHbGeaGqiVu0Je9sqqrpepC0xbbL8F4rqqrFfpeea0xe9Lq=Jc9 vqaqpepm0xbba9pwe9Q8fs0=yqaqpepae9pg0FirpepeKkFr0xfr=x fr=xb9adbaqaaeGaciGaaiaabeqaamaabaabaaGcbaqcLbsacaWGlb qcfa4aaSbaaKqaGeaajugWaiabes7aKjaadshaaSqabaaaaa@3C06@ are thickness and shape correction factors, respectively. K sh MathType@MTEF@5@5@+= feaagKart1ev2aqatCvAUfeBSjuyZL2yd9gzLbvyNv2CaerbuLwBLn hiov2DGi1BTfMBaeXatLxBI9gBaerbd9wDYLwzYbItLDharqqtubsr 4rNCHbGeaGqiVu0Je9sqqrpepC0xbbL8F4rqqrFfpeea0xe9Lq=Jc9 vqaqpepm0xbba9pwe9Q8fs0=yqaqpepae9pg0FirpepeKkFr0xfr=x fr=xb9adbaqaaeGaciGaaiaabeqaamaabaabaaGcbaqcLbsacaWGlb qcfa4aaSbaaKqaGeaajugWaiaadohacaWGObaaleqaaaaa@3B4D@ differs whether the blade is DCA, NACA65-series or C-series. For example, K sh =1 MathType@MTEF@5@5@+= feaagKart1ev2aqatCvAUfeBSjuyZL2yd9gzLbvyNv2CaerbuLwBLn hiov2DGi1BTfMBaeXatLxBI9gBaerbd9wDYLwzYbItLDharqqtubsr 4rNCHbGeaGqiVu0Je9sqqrpepC0xbbL8F4rqqrFfpeea0xe9Lq=Jc9 vqaqpepm0xbba9pwe9Q8fs0=yqaqpepae9pg0FirpepeKkFr0xfr=x fr=xb9adbaqaaeGaciGaaiaabeqaamaabaabaaGcbaqcLbsacaWGlb qcfa4aaSbaaKqaGeaajugWaiaadohacaWGObaaleqaaKqzGeGaeyyp a0JaaGymaaaa@3D9D@ for NACA65 profile. δ 010 MathType@MTEF@5@5@+= feaagKart1ev2aqatCvAUfeBSjuyZL2yd9gzLbvyNv2CaerbuLwBLn hiov2DGi1BTfMBaeXatLxBI9gBaerbd9wDYLwzYbItLDharqqtubsr 4rNCHbGeaGqiVu0Je9sqqrpepC0xbbL8F4rqqrFfpeea0xe9Lq=Jc9 vqaqpepm0xbba9pwe9Q8fs0=yqaqpepae9pg0FirpepeKkFr0xfr=x fr=xb9adbaqaaeGaciGaaiaabeqaamaabaabaaGcbaqcLbsacqaH0o azjuaGdaWgaaqcbasaaKqzadGaaGimaiaaigdacaaIWaaaleqaaaaa @3C6C@ is the deviation angle based on 10% thickness blades. Low subsonic flow regime in the corresponding compressor stage allows to use NACA65-series profile. The circular arc camber line is commonly used as an effective camber line for NACA65-series blades to provide a meaningful definition of leading and trailing edge blade angles. Generally, blade profile is constructed by superimposing prescribed thickness distribution upon the designed camber line. NACA65 thickness distribution is chosen on circular arc mean camber line with 10% maximum relative thickness t/c. 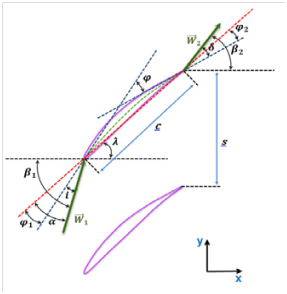 The relations used to build the mean camber line and the thickness distributions are obtained from Angier.9 The Figure 3 illustrates the geometric details concerning the circular arc camber line. Where x0 and y0 are the coordinates of the origin of the curvature radius; n isthe number of nodes used upon suction side and pressure side and j is the order of the node. φ c MathType@MTEF@5@5@+= feaagKart1ev2aqatCvAUfeBSjuyZL2yd9gzLbvyNv2CaerbuLwBLn hiov2DGi1BTfMBaeXatLxBI9gBaerbd9wDYLwzYbItLDharqqtubsr 4rNCHbGeaGqiVu0Je9sqqrpepC0xbbL8F4rqqrFfpeea0xe9Lq=Jc9 vqaqpepm0xbba9pwe9Q8fs0=yqaqpepae9pg0FirpepeKkFr0xfr=x fr=xb9adbaqaaeGaciGaaiaabeqaamaabaabaaGcbaqcLbsacqaHgp GAjuaGdaWgaaqcbasaaKqzadGaam4yaaWcbeaaaaa@3B3D@ is the local slope of the camber line. Figure 4 2D Geometry cascade at mean radius of the stage. This work is aimed to present a methodology for an axial compressor stage design using the mean line approach with constant outer diameter configuration COD. A FORTRAN code is developed and implemented to reach this preliminary design based on common thermodynamics and aerodynamics principles. The different properties at three stations; rotor inlet, stator outlet and intermediate face, are calculated. The detailed geometry of the cascade based on the NACA65 profile with circular arc camber line is obtained using NASA empirical relations. The obtained geometry will be exploited as input data in the analysis process to predict axial compressor stage performance curves, using either one dimensional mean streamline method or CFD approach, and also in the structured analysis. Tomita JT. Numerical simulation of axial flow compressors. Master Thesis, Brazil: Montenegro University; 2003. p. 170. Falck N. Axial flow compressor means line design. Master Thesis, Sweden: Lund University; 2008. p. 119. Alm Eldien A, Abd Elgawad A, Hafaz G, et al. Design and optimization of multistage axial flow compressor. 11th International Conference of Fluid Dynamics; 2013 Dec 19-21; Egypt: Alexandria; 2013. Al Obanor, Unuareokpa OJ, Egware H. An algorithm for the design of an axial flow compressor of a power generation gas turbine. Nigerian Journal of Technology. 2015;34(2):314−324. Dixon SL, Hall CA. 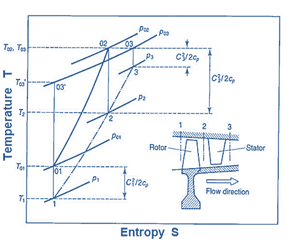 Fluid Mechanics and Thermodynamics of Turbomachinery. Butterworth Heinemann, USA: Elsevier; 2010. 477 p.
Saravanamutto H. Rogers R, CohenH. Gas Turbine Theory. 5th edn, London: Pearson Printice Hall; 2001. p. 491. Lewis RL. Turbomachinery Performance Analysis. 1st edn, London: Elsevier; 1996. 328 p.
Aungier R. Axial-Flow Compressors. New York: ASME; 2003. 378 p.
Bullock R, Johnsen IA. Aerodynamic Design of Axial Flow Compressors. USA: NASA report; 1965. 526 p.
©2018 Ramzi. This is an open access article distributed under the terms of the Creative Commons Attribution License , which permits unrestricted use, distribution, and build upon your work non-commercially.